FICGS is a fast-growing organization, player community and an international correspondence chess server. Here you can play chess online for free in rated class tournaments, two players matches, advanced chess and a unique correspondence chess world championship in a big knockout tournament. The winner will play current world champion in a 12 games match. We also organize special events, thematic chess, big chess, chess 960, poker texas holdem heads up tournaments, some with money prizes. Check the waiting lists. 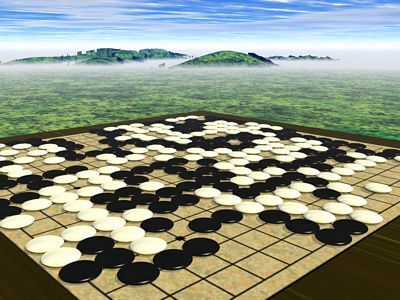 At last on FICGS, you can play Go (围棋, 바둑, 囲碁, Cờ vây, Го) tournaments and world championship. Even if computers are now able to beat the very best human players from China & South Korea, its complexity still makes it one of the most interesting board games. Play this fascinating game at FICGS. Eros Riccio won the final match of the 16th cycle, his challenger kindly accepted to answer a few questions and shared his views on correspondence chess and the influence of chess engines such as Stockfish, Houdini or Komodo, and the AlphaZero AI. You can read the complete interview in the forum. Although many say that it seems quite impossible to beat such a correspondence chess champion in a 12 games match nowadays, you'll probably find some tips in the previous answers by former champions & finalists. Always playing the best move according to the strongest chess engines may not be the solution. Ideas from the famous "Art of war" by Sun Tzu still can be used in this modern chess era, and maybe in other games as well like Go & poker holdem, now all dominated by machines. After his win in the Go world championship final match, Yen-Wei shared his analysis on the games and his views around the world of Go (Weiqi, Baduk) and particularly computer Go in the forum. Dear chessfriends, the very best centaur (human/machine) teams produced a bunch of great games more, and the winner of the 4th FICGS chess freestyle cup is Alvin Alcala, congratulations to him! Thanks to all players who participated. FICGS applications for Android are now available to download. Install it from Google Play Store, then you'll be able to play chess online, Go (weiqi) & Poker Holdem on your phone. Playing online games including chess, Go, and poker hold’em is easier than ever from the comfort of your mobile phone or tablet. By the way, if you're fond of chancy games, you may have a look at TheCasinoDB reviews of new uk casino sites to help you to make the best of the numerous and more or less trustable websites involved in this business. So whether you’ve got an iPhone, Google Phone, HTC or Samsung device, all you need to do is connect to the world wide web and enjoy the benefits of a modern touch interface for a better gaming experience. And with specialist games providers and casinos using a mobile-first approach, it’s only going to get better! You can also find specific informations about gaming websites according to the country. In example, certain websites detail UK casinos sorted according various criteria. Other useful websites like these ones will provide you more informations on all online alternatives, listing both mobile and desktop versions, either focused mainly on the British market, the Swedish one or any other. It will also tell you if it is possible to use either Bitcoin or an e-wallet like Paypal, Neteller, Skrill, Paysafe, Epay, Netpay & so on, but surely most support a wide variety of currencies. Online gaming isn't all about chess, which is considered itself as a chancy game according to the country, there are also casino games such as Blackjack and slot machines, thus you can play games for real money. In Online Casinos one can play casino games for free or for money. All of these games are played at a long-term advantage for the casino, however in some casino games, such as Spanish 21 and Blackjack, the player makes decisions so the house edge may be reduced to about 0.5%, even without using card counting. There are many tactics and strategies for casual players. Many websites will help you to make the best of these online games : Each country has its own guides, from scandinavia to japan. Many casinos require to get an account, however it is often possible to play without any registration. Casino guides will allow you to read a bit more on strategies and how to find the best casino bonuses that can give you extra money and free spins. Gamblers from the United Kingdom in particular can find the latest released casinos very easily. Undoubtly we will see a growing number of new online casino sites with UK license next year. It is much more difficult to find pertinent information when not limiting your searches to a particular country, so if you need more good stuff on any casino online wherever in the world, you can have a look at one of these links, you will probably find something there. Also check out the best online casino for UK players right now by visiting Casivo for up to date casino reviews. Finally, gambling is nowadays a very social thing, and in some cases a short cut to get rich. Read more at www.sveacasino.se how to take advantage of the best offers for online gambling. Finally, this oldschool chess website now has Facebook apps to play blitz and rapid chess games, added to the Android applications for correspondence chess, Go (baduk) & poker. Unfortunately, still no app for Iphones but this could be a next step. You'll find all links inside as soon as you're registered and connected, or you can just enter as guest. Another next step could be to offer a fully free Go server playable through a Facebook app as well, just wait and see. Even if the conditions of the first chess match AlphaZero vs. Stockfish were not really fair to compare the efficiency of both engines, it is no doubt that a new step has been made in artificial intelligence this year. AlphaZero (and its incredibly fast hardware) was able to master chess, shogi & Go in a few hours, beat the most famous human masters and already taught us with new strategies and views in chess openings & joseki at Go (weiqi). Will Google Deepmind envisage to make its so-called A.I. master Poker Holdem next? We'll probably have an answer within a few months. However, it seems that we're not so close to see an artificial consciousness that could be compared to the human one, that is probably our very last privilege. Meanwhile, let's play!